Strainstall's Container Weight System (CWS)™ seamlessly integrates load monitoring technology onto existing container handling equipment, with no operational impact to ports and terminals. CWS™, specifically developed to meet the International Maritime Organisation's amendments to SOLAS safety guidelines, delivers accurate weight verification data in real-time, as part of a ports regular lifting cycle. UPDATE: CWS™ now has full EU-type approval! Fully configurable to your specific spreader based cargo handling equipment, CWS™ seamlessly integrates into existing terminal operating systems (TOS), giving a simple and automated process for producing verified gross mass (VGM) for SOLAS compliance. Strainstall’s CWS™ is designed to be retrofitted to existing container handling equipment with no modification required enabling quick and easy installation in about an hour. Working closely with original equipment manufacturers (OEMs) CWS™ is fully adaptable to suit all the major crane and spreader manufacturers’ equipment. The system can be retrofitted into the spreader headblock or at the twistlock making it a permanent feature of the container handling equipment with minimal wear. Alternatively, the twistlocks themselves can be replaced if 20ft twinlift spreaders are used. Strainstall's CWS™ solution has been specifically developed to meet container weight verification regulations with minimal impact to port and terminal operations. 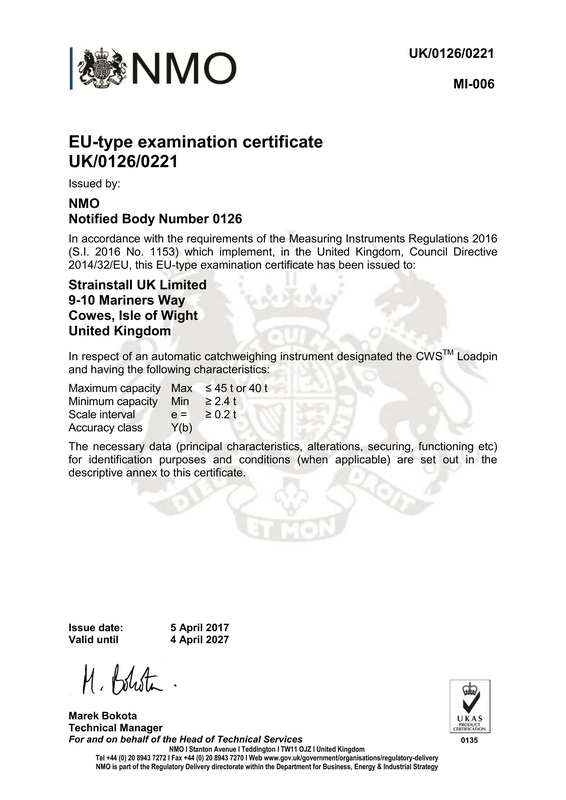 CWS™ has successfully achieved full Automatic Weighing Instruments EU-type approval from the National Measurements and Regulatory Office. Successful trials prove Strainstall's Container Weight System™ delivers extremely high accuracy levels. Successful trials of the latest generation Container Weight System™ at some of Europe's largest container terminals have resulted in 100% of all data points falling within ± 300 kgs up to 20 tonne and 1.5% of the load beyond 20 tonne - giving you full confidence in the performance of CWS™ to ensure SOLAS compliance. Download the full CWS™ trial report (2.6MB). Yes! I would like to receive updates about products, services and news from Strainstall and the James Fisher group of companies. If you no longer wish to receive marketing communications from us, please unsubscribe here. For more information on how we handle your data, please read our corporate privacy statement.